On this blog, I do many things. I review TV shows, review movies, rant about the entertainment industry and periodically mention the Red Sox. One thing I've never been accused of using this blog for before is actual reportage. I save that stuff for the Zap2it blog, where I can delve into the serious journalistic business of interviewing Adrian Pasdar about whether or not he conditions his beard. But at CBS' Press Tour party last night, I (along with my Zap2it colleague Rick) conducted an interview that dealt, at least partially, with subject matter that's utterly useless for Zap2it, but completely on-topic for this blog... A little show I like to call "Method & Red." I like to call it that, because that's its name. At Zap2it, we have a great collective love for "HIMYM," and therefore a respect for Bays and cohort Craig Thomas. That respect only grew when Rick pointed out to me that before "HIMYM," Thomas and Bays' credits included "Method & Red," but not just "Method & Red," the episode titled "The Article," which featured not only music critic Keith Debeetham, but also self-explanatory childrens' entertainer Downtown Clowny Brown. Unfortunately (or fortunately), Bays was initially unconfused when we approached him at the party about Keith Debeetham. As he explained, "Keith Debeetham was the editor we worked for at the 'Late Show.' He was the guy, day in and day out, we'd be putting together skits for the show and he was the guy we'd be editing it with, so it was shout-out to him." Ooops. Poor research on our part. When we explained that we meant "Method & Red," he remained largely enthusiastic. "It feels like a dream," he laughed. "I'm not sure I actually worked there. It was a very surreal dream." Thomas and Bays arrived on "Method & Red" after they'd put in their time writing for "Late Show with David Letterman" and "Oliver Beene." "It was funny, because they'd just signed Craig and I to a deal at Fox," Bays recalls. "We were freshly on a deal and they looked down their roster of shows and they're like 'What show do you put these two white guys from the suburbs on? Oh wait! We have a deal with the Wu Tang Clan! OK. Yeah. Let's get them together. Yeah. That'll work.'" 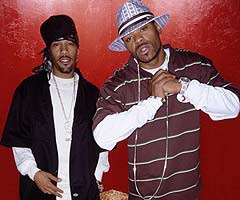 Did they spend any wacky times with Method Man and Redman? "I think I met them both once, but yeah, I didn't really work close with them," he laughs. "We just wrote the script and then left. I feel bad, what a journeyman kind of experience it was." I mention this blog's ongoing campaign to get "Method & Red" released on DVD, asking if he wanted to join the plea. "Of course I do! Well, no. Here's my plea -- My plea is wait until after the writers' strike, when the writers actually get paid for the DVDs and then release it. That's my plea. Don't buy it until I'm getting a cut of it, America." i hope you at least get a shout-out in the acknowledgments on the hypothetical-DVD packaging after all this. i dunno, dan. christopher titus thinks one man can make a difference.